Dr. Peter C. Whybrow is Chair of the Department of Psychiatry and Biobehavioral Sciences at UCLA. 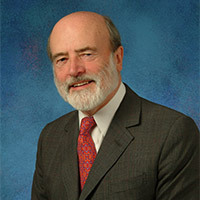 Dr. Peter C. Whybrow, physician-in-chief of Stewart and Lynda Resnick Neuropsychiatric Hospital at UCLA, is also the executive chair of the Department of Psychiatry and Biobehavioral Sciences at the David Geffen School of Medicine at UCLA and director of the Semel Institute for Neuroscience and Human Behavior. An international authority on depression, manic-depressive disease and the effects of thyroid hormones on the brain and human behavior, Dr. Whybrow has lectured widely across the United States and Europe. He is a founding member and fellow of the Royal College of Psychiatrists, a fellow of the American Association for the Advancement of Science, the American College of Psychiatrists and the American Psychiatric Association. Born in England, Dr. Whybrow received his training in endocrinology and psychiatry in London and North Carolina. He was a member of the scientific staff of the British Medical Research Council before coming to the United States to join the faculty of Dartmouth Medical School as chairman of psychiatry, and later as executive dean. Prior to joining the faculty at UCLA, Dr. Whybrow was the Ruth Meltzer Professor and chairman of the Department of Psychiatry at the University of Pennsylvania.